VATICAN CITY (CNS) — No periphery is far enough away to escape a pope’s purview. Not even outer space. From Pope Gregory XIII’s observational tower built in the Vatican Gardens in the 16th century so celestial studies could aid the reform of the calendar to Pope Leo XIII, who officially re-founded the Vatican Observatory in the late 19th century, popes have kept their eyes fixed on the heavens. Pope Pius XII and Blessed Paul VI both peeked through the Vatican’s large telescope out at the papal summer villa in Castel Gandolfo. Blessed Paul got a chance to see the lunar area where Apollo 11 landed in 1969; he hand-wrote a message that was left on the moon along with a Vatican flag. Popes Benedict XVI and Francis each had a live linkup with the crew of the International Space Station to ask the astronauts questions about the future of planet Earth and the spiritual impact of seeing the world — as one astronaut put it — a bit from God’s perspective. From space, Earth has “no borders, there is no conflict, it’s just peaceful,” Commander Randy Bresnik told Pope Francis. That the human race should try to get space “right,” that is, make sure this infinite corner of creation might remain free of borders and conflict, was a major reason the United Nations created an ad hoc committee on the peaceful uses of outer space in 1958 — just one year after Sputnik 1, the first artificial satellite, was launched into Earth’s orbit. This now-permanent committee, which reports to the U.N. General Assembly in New York, has 84 members, making it one of the largest committees in the United Nations; its work is organized and run by the U.N. Office for Outer Space Affairs in Vienna. The Vatican has long been part of this interplanetary diplomacy with its own “space missions,” with its representatives to both the Vienna-based U.N. Office for Outer Space Affairs and the New York-based U.N. Committee on the Peaceful Uses of Outer Space. For decades, these Vatican delegates have echoed the popes’ enthusiasm for scientific discovery and the hope such progress would always be used for the benefit of all people. It seems only fitting that Blessed Paul VI, the first pope to travel by airplane, would have a special place in his heart for the emerging space programs. He gave numerous blessings, remarks and speeches about discovering the cosmos, and he even met U.S. astronauts Neil Armstrong, Edwin “Buzz” Aldrin Jr. and Michael Collins at the Vatican in 1969. He told them he admired their courage, spirit of peace and their aim of serving humanity with their mission. Now, 50 years later, countries have developed international agreements and five space treaties on many issues, including the non-appropriation of outer space by any one country, the freedom of exploration and arms control. U.S. President Donald J. Trump’s recent proposal of setting up a “space force” to defend the United States may conflict with the Outer Space Treaty of 1967, which allows military equipment and services in space, but not military stations or any weapons of mass destruction. The Vatican has repeatedly expressed hope that countries can finalize an International Code of Conduct for Outer Space Activities that would “ensure a fairer and safer use of outer space,” Archbishop Bernardito Auza, the Vatican’s permanent observer to the United Nations, said at a U.N. committee meeting in 2015. The Space Code of Conduct would be a voluntary, nonbinding “rules of the road” so-to speak, regulating increasing satellite traffic and space activities, including preventing hostile actions and the weaponization of space. Jesuit Brother Guy Consolmagno, planetary scientist and directory of the Vatican Observatory, told Catholic News Service that some other big issues still demanding ethical consideration and better guidelines include the mining of asteroids for natural resources and the production, use, accessibility and piracy of data collected in space. “Who will make the rules for how space resources are used,” whether those resources are metals or bytes, and how will those rules be enforced, he wrote in an email response to questions. Brother Consolmagno, one of five papal astronomers to have an asteroid named after him, was representing the Vatican in Vienna for the 50th anniversary of the first U.N. Conference on the Exploration and Peaceful Uses of Outer Space. The Office for Outer Space Affairs was celebrating this landmark event by hosting UNISPACE+50, a series of high-level meetings and talks June 18-21 for all U.N. member states to figure out how global space cooperation can benefit everyone — not just the few with the money and the technology — back on Earth. The goal is to create a comprehensive “Space2030 agenda” that will seek to map out how space-related activities can help achieve the U.N. Sustainable Development Goals. In a historic way, the Vatican prepared for this summit by hosting a joint seminar in the spring at the Vatican Observatory in Castel Gandolfo with the U.N. Office for Outer Space Affairs. 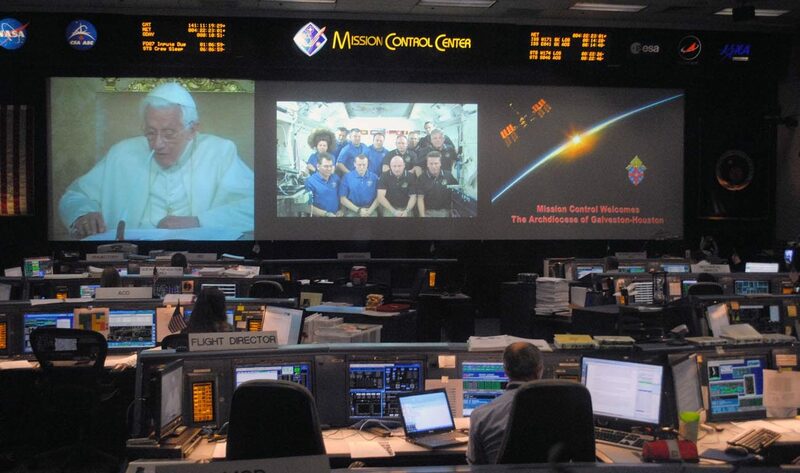 The session brought Vatican representatives and experts together to craft a document Brother Consolmagno will deliver to the UNISPACE summit as it seeks to make outer space not a new battleground, but a place that benefits everyone. The church has had an important voice in helping guide this process, starting with the Second Vatican Council’s “Gaudium et Spes,” which noted humanity’s drive “to master outer space” would need the same selfless and redeeming spirit necessary in all human endeavors. Importantly, the principles offered by Pope Francis in his encyclical, “Laudato Si’, on Care for Our Common Home,” can be applied to all of God’s creation, not just terra firma. “The pressing call and challenge to care for creation invite all of humanity to work without hesitation toward sustainable and integral development and toward sustainable, peaceful uses of outer space,” he said. With today’s expanded horizons, the Nativity message proclaimed by a host of heavenly beings, “peace on earth, goodwill to all men,” will have to make room for space.